I can't remember if it was Girlichef's idea or mine to make empanadas for She Made/Ella Hace this month, I just know that I was more than happy to oblige. I'm always looking for an excuse to make empanadas, mostly because there are only two kinds of empanadas sold in my small town: Empanadas de Piña (pineapple) and Empanadas de Leche (vanilla custard). That's it! Well, sometimes you can also find strawberrry jam filled empanadas, with a crumbly cookie-like crust, which I love. 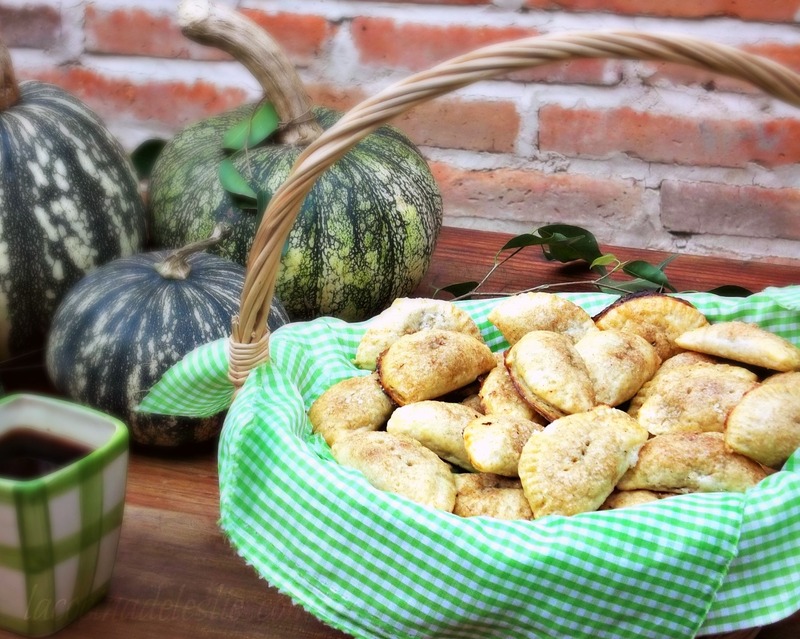 But for She Made/Ella Hace, there was really only one kind of empanada I wanted to make...Pumpkin Empanadas! Pumpkin Empanadas have been my absolute all-time favorite empanadas since I was a little girl. They were the only kind I chose at the Mexican panadería (bakery). But as much as I enjoyed the Pumpkin Empanadas from the panadería, they were nothing compared to the ones my grandpa used to make. The dough was buttery and tender. And the filling was only slightly sweet, but bursting with flavor. You could taste each of the spices as soon as the filling touched your tongue. I really think my grandpa missed his calling. He was an expert baker. About once a month, Pappy would make three or four different kinds of empanadas. My favorites were calabaza (pumpkin), manzana (apple), and ciruela pasa (prunes). But like most Mexican cooks, he never wrote anything down, and never bothered to measure ingredients. I wish I would have paid more attention to how Pappy made his dough, because to this day, I haven't been able to recreate it. Thankfully, my go-to cream cheese empanada dough works perfectly with this recipe. The important thing is that I've got the filling down perfectly. As I was cooking the pumpkin filling for the empanadas, the aroma of the spices floated through the air, making my house smell like Christmas. So warm and inviting. Even Hubby and a couple of his customers commented about the intoxicating aroma in the shop. If I closed my eyes for just a second, it felt like I was standing in my grandparents' little kitchen for Christmas or Thanksgiving. For the filling: In a medium saucepan, combine the pumpkin puree with the sugars and ground spices: cinnamon, nutmeg, cloves, and ginger. Cook over low heat until the sugar has completely dissolved and the pumpkin puree is heated through. Remove from heat and stir in the butter; set aside and let cool to room temperature. Prepare the dough, combine the flour and salt. With the help of a potato masher, add in the cream cheese and butter to the flour, until no trace of flour is visible. Press the dough together to form a ball. Wrap in plastic and refrigerate for about 30 minutes. Divide the dough in half. Return one half of the dough to the refrigerator, while you work with the other half. Roll out the dough on a lightly floured surface, or between two sheets of plastic wrap, to about 1/8-inch thickness. Cut out circles with a 3-inch round cookie cutter or empanada mold. To make the empanadas, spoon about a teaspoonful of pumpkin puree into the center of each circle of dough. Using the tip of your finger, lightly moisten the outer edge of the dough with water. Gently fold the dough circle in half, pressing the edges together with the tines of a fork to seal in the filling. Pierce the center of each empanada with a fork. (This allows for the steam to escape.) Place on a lightly greased baking sheet. Continue with the remaining dough. Refrigerate the uncooked empanadas for about 30 minutes before baking. Preheat oven to 350F. In a small bowl, combine the 1/4 cup of granulated sugar with 1 teaspoon of ground cinnamon. Brush the uncooked empanadas with the slightly beaten egg, then sprinkle a little of the cinnamon-sugar mixture on top. Bake at 350F for about 15 minutes or until light golden brown. Remove the empanadas from oven and let cool for about one minute before transferring to a wire rack to cool completely. Serve with coffee or Mexican Hot Chocolate. Enjoy!!! 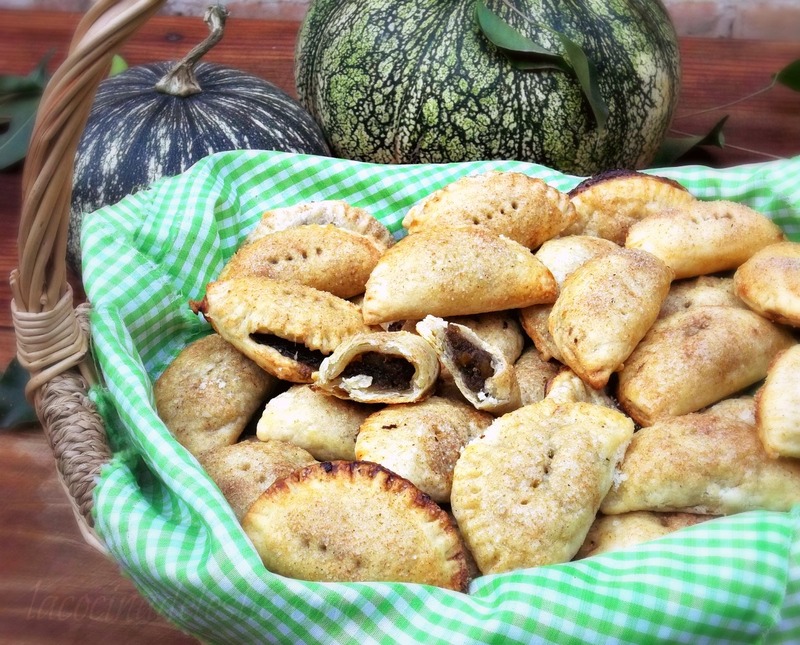 Recipe yields about 24 to 30 Mini Pumpkin Empanadas. Now head on over to Girlichef's blog! 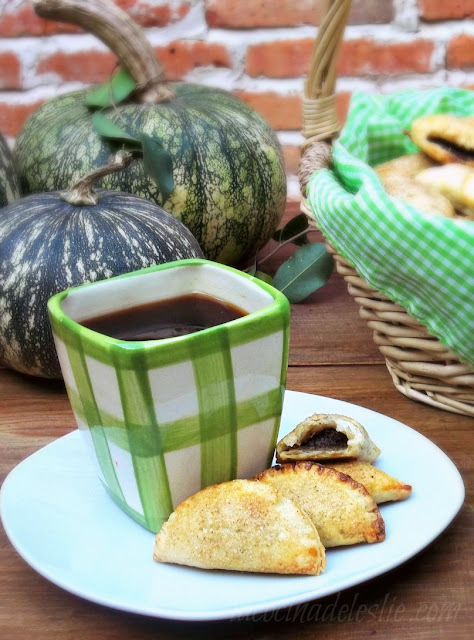 She's made TWO different kinds of empanadas: Apple w/ Almond Paste AND Pumpkin with Piloncillo & Cinnamon. What's your favorite kind of empanada? Oh my goodness! They look perfect! Sounds yummy, I am going to have to try these while we have pumpkins, well calabazas in the stores here. Hi Leslie, have just hopped over from Coffee Friday! Love your empanadas, they do look perfect! Not a big fan of pumpkin but I must say these look tempting! Hi LinsFood! Thank you so much for stopping by and commenting! :) If you're not a fan of pumpkin, that's totally okay. You can fill these empanadas with just about anything...Custard, Lemon Curd, Nutella, fruit puree, or your favorite jam. These are just so cute! Once again you have inspired me. I had never thought to make a pumpkin empanada, but these just look so appealing. Thanks so much for sharing. 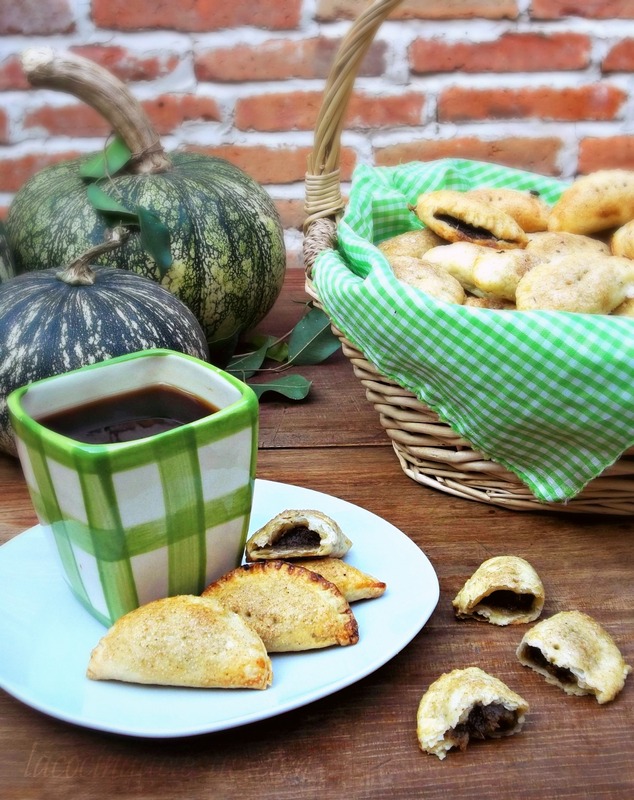 I was randomly searching for an empanada recipe and came across this, but after making these I definitely have to become a regular reader, these were AMAZING. The pastry is absolutely perfect. Thank you! Hi Leslie...I've been searching for the prune empanada recipe. I like you have wonderful memories of these delicious treats and my mom never wrote a single recipe down either. Can you share your recipe for the prune filling. My mom also used to make a sweet meat empanada. Cooked pork ground and sweetened. So our holidays consisted of prune, sweet meat, and prune/sweet meat combination. Are you familiar with the sweetened pork version?